A Boeing 737-500 taxied off the runway at Padang, Indonesia, when the sick pilot lost situational awareness, according to an investigation report published by the Indonesian National Transportation Safety Committee (NTSC). 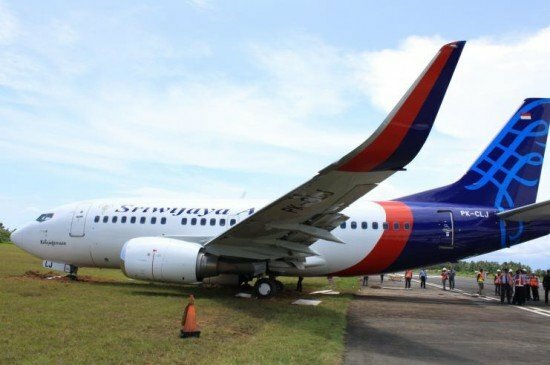 On 27 March 2013 a Boeing 737-500 aircraft registered PK-CLJ operated by Sriwijaya Air operated a scheduled passenger service, flight SJ-021, from Medan-Polonia Airport to Padang-Minangkabau International airport and then to Jakarta-Soekarno Hatta International Airport. Prior to leaving the hotel at Medan the pilot in command had stomach aches and the crew noticed that the PIC went to the toilet several times during the flight from Medan to Padang. After arriving at Padang, taxiing to the parking position, witnesses reported that the aircraft taxi speed was faster than normal. The FDR recorded that the aircraft taxi speed was 18 knots, which was 8 knots faster than the recommended speed. While stopping on the parking stand number 4, the aircraft did not stop on the proper position. It stopped around 4 meters past the marking line with the left wing almost hitting the aerobridge. The marshaller informed that he already gave stop signal, however the aircraft kept moving. The aircraft then pushed back to the correct position and all passengers disembarked. There was no hazard report made by the Sriwijaya air staff or Padang Airport staff. After the preparations were completed, the flight then continued to Soekarno-Hatta Airport. The PIC acted as Pilot Flying and the SIC as Pilot Monitoring. At 18:42 hours local time the pilots received clearance to taxi out and enter back track runway 15. When approaching the threshold of runway 15, the pilot turned the aircraft to the left. The aircraft stopped at 18:55 on an approximate heading of 270° with the nose wheel out of the runway about 4.2 meters and in full deflection to the left. On the runway 22 meters of rubber skid mark of the nose wheel were found, beginning from the center until aircraft stopped. The FDR data revealed that during the initial turn for a line up on the runway 15, the aircraft taxi speed was 21 knots. The taxi speed should have been 5 to 10 knots during the turn to minimize turn radius. The airplane was not damaged and none of the 95 passengers and six crew members were injured.